Fredrick the shadow Ruki was pressed very firmly into a chair by the green Grarrl. The place he had been led to was a small building in the Marketplace, not at all the foreboding gothic mansion he had expected when he heard the name in the lift. The insides of the building were more impressive, though. It was a large office, filled with antique furniture. Books, globes, and exquisite chess sets sat on tables around the edges, while a map of ancient Neopia hung on the wall behind the desk. Mr. Jennings, a green Krawk with a devious little smile, was sat on the opposite side of the desk to Fredrick. “Do you know who I am?” the Krawk asked politely. The Krawk tapped a file on his desk meaningfully before opening it. A photograph of Fredrick was paper clipped to the document inside. Fredrick blinked once. That was certainly an impressive spiel. Half of that was stuff Fredrick thought he alone knew. Certainly the stuff about his involvement with Joseph Shome was confidential. Fredrick had been the only one who ever knew he was in Altador. Something else caught his eye, though. Fredrick smiled. “I escaped,” Fredrick replied simply. “Yes, perhaps the best skill you have,” Jennings commented, raising an eyebrow. “You need something done,” Fredrick concluded. Fredrick nodded. It sounded pretty easy; he’d done that countless times before. “What’s the group?” he asked. Jennings smiled, as if he’d just heard a joke. “It is... a resistance movement,” he said as he stood up to look at the map behind him. “A resistance against what?” Fredrick asked. Jennings looked back over his shoulder. The Green Grarrl coughed politely from behind Fredrick. “I read about that, happened just before the Altador Cup, you destroyed most of the Shenkuu fleet,” Fredrick noted. “An Empire of your own?” Fredrick asked. “So people have started a resistance movement against you... even though you are not actually in power?” Fredrick asked. “What if I say no to this job?” Fredrick asked. “Do you have any leads?” Fredrick sighed, understanding that ‘no’ wasn’t an option. “Follow the berets, great,” Fredrick sighed again. Mr. Black cleared his throat. “Mr. Entwhistle has an appointment, sir,” he announced. Jennings gave Fredrick a look that very clearly said it was time for him to go. The Ruki got up, and let Mr. Black open to door for him. A rainbow Lutari was waiting outside, and was gestured in as Fredrick left. The door closed firmly behind him. Fredrick leaned back against the wall for a few minutes. Neopia Central was a city, teeming with millions of Neopets. How did you find the one group of people that didn’t want to be found? Fredrick shook his head. He wasn’t thinking like himself; this business with Jennings had thrown off his game. He just had to get into the mindset of a revolutionary, a resistance fighter. Someone who rebels against those in power. Someone with no power themselves. Fredrick chuckled to himself. He knew where to find the poor people in Neopia Central. Most tourists visiting Neopia Central don’t venture beyond the Marketplace. The brightly coloured shops and happily smiling vendors make the city seem like a welcoming, idyllic place. If the tourists were to venture to other areas of the city, they would see a different picture altogether. The Docklands was Neopia Central’s port. Most of the rich and famous Neopets weighed anchor at Kiko Lake, leaving the port in the city for industrial freighters and the less savoury ships. Ships, and the construction industry that came with them, needed workers. It hadn’t been long before the immediate area surrounding the port had become a shanty town of sorts. The Docklands, as the area was now known, was nothing more than a slum. The houses were packed in tight, and the city’s smog curled around the street corners almost constantly. The pollution and the lack of money made disease rife. This place was Fredrick’s first home. He hadn’t been rich enough to afford one of the matchstick hovels, though; he’d had to make do with the streets. Sometimes he’d ventured into the Old Quarter, and the graveyard there, hoping to find some comfy grass to sleep on. Most of the time it had been doorways to sleep in for him, though. Now Fredrick lurked in those same doorways, his shadowy frame masked by the night and the smog that had set in. He was waiting, observing the passers by and absorbing every detail about them. This was how he always started, by observing the mark. He’d had set backs in Faerieland and Altador... and the latter had shaken him badly. But he was a professional, and conning Neopets was his job. One such Neopet caught his eye, a stocky yellow Bori who seemed to be walking rather nervously, as if he was afraid he was being watched. The most noticeable aspect of the Bori, though, was the crisp black beret he was wearing. Fredrick had to suppress a laugh. Jennings had mentioned them, hadn’t he? The Ruki silently detached himself from the shadows and began to stalk the nervous Bori. He was gradually heading away from the more populated areas of the Docklands, as far as Fredrick could tell. In any place that would have been strange, but in the Docklands it was plain stupid. Thieves lurked everywhere. If you stood still for more than ten seconds you’d be mugged. Heading down quiet alleyways was practically begging criminals to follow. The Bori was certainly wary of something; he kept glancing over his shoulder at every turn. Once he even doubled back on his tracks. After what seemed like miles of twisting alleys, the Bori eventually came to a stop outside a boarded up house. He knocked twice on the door in quick succession, and then knocked again once after a pause. A metal plate in the door slid sideways, revealing the eyes of another Neopet inside. “The rain in Altador falls quickly,” the Neopet commented. “But the walls can withstand any flood,” the Bori replied with a wink. The Neopet inside nodded, and the metal plate was pushed back. The door was unlocked, and the Bori disappeared inside. Fredrick ducked behind the corner, and opened up his battered old briefcase. He’d dropped off his stolen jewels somewhere safe, now the contents were only the selection of morphing potions he always carried. He carefully selected the one he would use, and drank it down with one gulp. His features began to twist and change, the fog masking his form as it altered species. A moment later, the briefcase clicked shut and was tucked away in the corner, disguised as rubbish. A brown Grundo straightened himself out and set off down the street. He came to a stop outside the boarded up house, and knocked on the door. He mirrored the Bori’s knock, two quick taps and then a slower third. The metal plate slid back, revealing the guard inside. He regarded Fredrick with suspicious eyes. “In Faerieland water flows freely,” the guard said, expecting a reply. Fredrick paused. There was clearly a code, but he no idea what it was. “Yet that is not all that runs free?” Fredrick guessed. “Nice try,” he laughed, and moved to close the eyehole. Fredrick smiled. He was on sure ground here. These people were commoners, and they had one track minds. If they had to remember a password, there would be only one word they would choose. 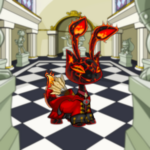 The Neopet inside the building nodded begrudgingly, and the metal plate slid back. The sounds of a dozen locks being undone followed, before the door finally opened. Fredrick now saw that it was a very overweight Bruce stood behind the door. Fredrick nodded and made his way inside. The door closed behind him, and he was reduced to only the dim glow of a candle inside. Most of the house seemed to be crumbling. The doorway that would have led into the front room had been boarded up, and the staircase leading up had crumbled into the stairwell. A stone staircase leading down was the only route open. Fredrick descended into the darkness. He was in, and that was half the battle. Getting out might be the other half though. ;D Maybe it's time the little baby had his eyes checked out.